January 27, 2019 By Bob Pilgrim & filed under All Articles, Rifles & Carbines, Weapons. 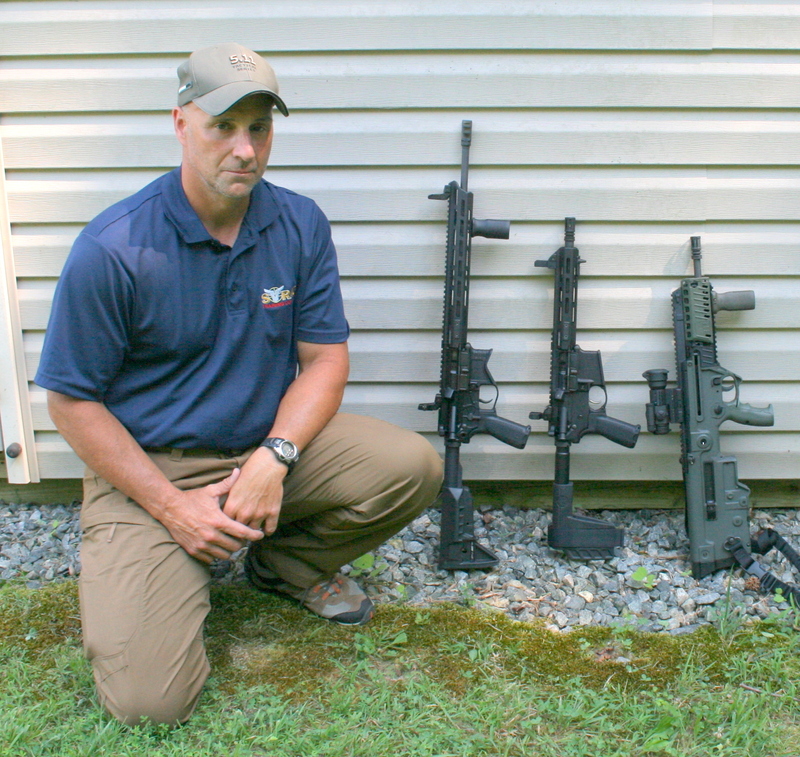 Former U.S. Air Marshal Ken Trice shows overall length differences among (left to right) 16-inch barrel SAINT AR rifle, nine-inch barrel SAINT .300 BLK pistol, and 16.5-inch barrel Tavor X95 Bullpup rifle. Bullpup would solve subcompact rifle’s loss of muzzle velocity, reduction in engagement range, and terminal effectiveness while retaining high degree of maneuverability at close quarters. I was scratching my hairless head trying to figure out how another AR platform could be so successful in a field inundated with numerous variations on Eugene Stoner’s military rifle. The Springfield Armory (SA) SAINT™ AR-15 rifle is a rookie in a population of very mature antecedents, but it has rapidly captured a much respected percentage of the black rifle market. The free market has looked at the quality build offered by the Geneseo factory team and determined that, like SA’s other long and short firearms, the shooter gets a great deal for their money. After immediate success with their four different versions of the SAINT shoulder weapon and one 5.56x45mm pistol, SA now offers the same style pistol in .300 Blackout (BLK). While performance of the 7.62x39mm (Maybe the Soviets were right? ), 5.56mm with heavier bullets, and 7.62x35mm BLK are pretty close, the last round outshines the others at longer ranges because of its superior ballistic coefficient. All can be suppressed at the muzzle, and downrange ballistic crack can be mitigated with heavier and slower-moving bullets not exceeding 1,050 fps. The short .30 calibers are more appropriate for suppression because they can fire a very broad range of bullet weights, including heavier subsonic loads. For example, .30-caliber bullet weights ranging from 78 to 240 grains give the .300 BLK broad latitude of supersonic and subsonic loads that have demonstrated excellent accuracy. No surprises here. 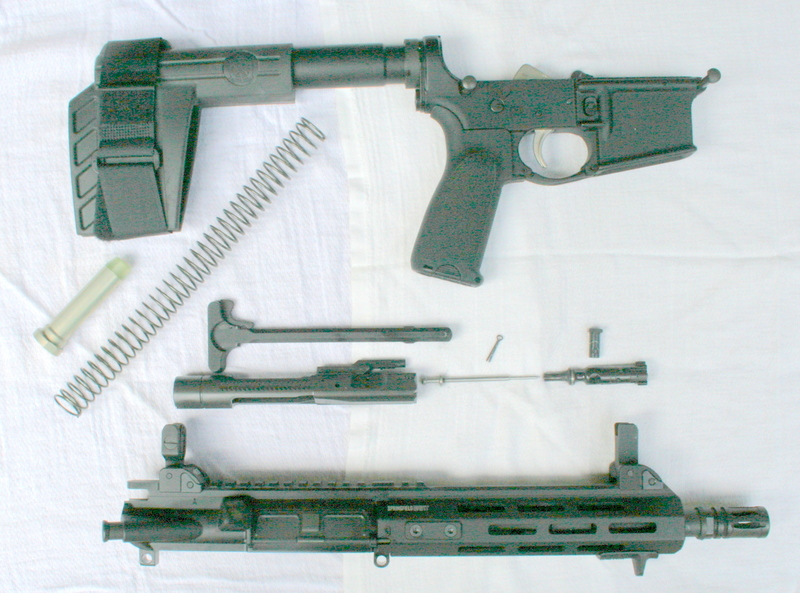 SAINT is a typical AR when field stripped. SAINT arrives with no sights. Furthermore, when fired from a nine-inch barrel, a 125-grain .300 BLK achieves a muzzle velocity of 2,100 fps. At 100 yards, it arrives with 993 foot pounds of kinetic energy. In contrast, a 55-grain 5.56x45mm fired from a 20-inch barrel exits at 3,100 fps and delivers 919 foot pounds of kinetic energy at 100 yards. Of course, there is more involved in wounding than the round’s energy dump. But the .300 BLK outperforms the AR in this category with a much shorter barrel that gets better as ranges increase. I am not going to exhaustively debate the advantages and disadvantages of the above triad of kindred rounds, but the .300 BLK has piqued the interest of foreign and domestic Special Forces units and is operational among Tier One units. Specifically, it reliably fills mission requirements for more agile short-barreled rifles and carbines not only for CQB environments, but is also subsonically lethal out to 100 yards and supersonically effective well beyond that distance. The .300 BLK provides great flexibility in a condensed package. But to make the fast-slow velocity transition function reliably in semiautomatic weapons, adjustments to the gas block have to be made with most variants. The SAINT is no exception to this requirement with most subsonic loads. SAINT’s top rail has numbered brackets for consistent mounting and remounting of sights. The SAINT pistol has a pistol-length direct-impingement gas system with adjustable gas block. At its muzzle, the nine-inch CMV (Chrome, Moly, Vanadium) medium-weight barrel with 1:7 twist is equipped with a standard M4 flash suppressor. It is easily removed for mounting suppressors or more sophisticated muzzle brakes/compensators to reduce flash and sound signature or augment control. No sights are provided with SA SAINT pistols, and it’s shooter’s choice for irons and/or optics or both. Since some of the build components were acquired from Bravo Company Mfg (BCM), I contacted CEO Paul Buffoni and he was kind enough to send a set of his Diamond Head manufactured folding sights. They were promptly locked onto the SAINT’s 1913 Picatinny rail with its numbered mounting points for consistent remounting of optics or irons. The rear system has CQB and long-range flip-up apertures and is adjustable for windage. The front sight is elevation adjustable. The front half of the rail rests on the free-floating M-LOK (Modular Lock) aluminum, SA proprietary T6 Type III hard-coat anodized handguard. Its aft section sits atop the pistol’s SA forged Type III hard-coat anodized and aircraft-grade 7075 T6 aluminum upper receiver with forward bolt assist. The vented handguard is slim, which facilitates a wrap-around handgrip, and features an under-guard hand stop. The latter might be better replaced with a forward vertical pistol grip, but that is an ATF verboten on an AR pistol. The six rows of six slots accommodate almost any whiz-bang device to augment the weapon. A military-style charging handle mechanically operates the enhanced M16 Melonite finished bolt-carrier group. Bilateral anchoring plates attach the M-LOK compatible handguard to the barrel nut. The AR profile bolt is protected by a spring-loaded dust cover that opens when the action is cycled. A brass deflector sits in front of the forward bolt assist and its efficiency is attested to by its brass smeared face. Anyone familiar with the AR-15/M16 systems should have no problem running or maintaining the SAINT. Ken Trice demos use of arm brace when shooting SAINT as a pistol. Extra weight makes steady hold a challenge, but it can be done. Recoil is heavier than 5.56mm, but not dramatically so. The SAINT employs a fixed SBX-K forearm stabilizing brace from SB Tactical, the plank owner of the ATF-compliant pistol brace. The rubber cup fits over the forearm and a Velcro strap tightens the brace to the appendage. 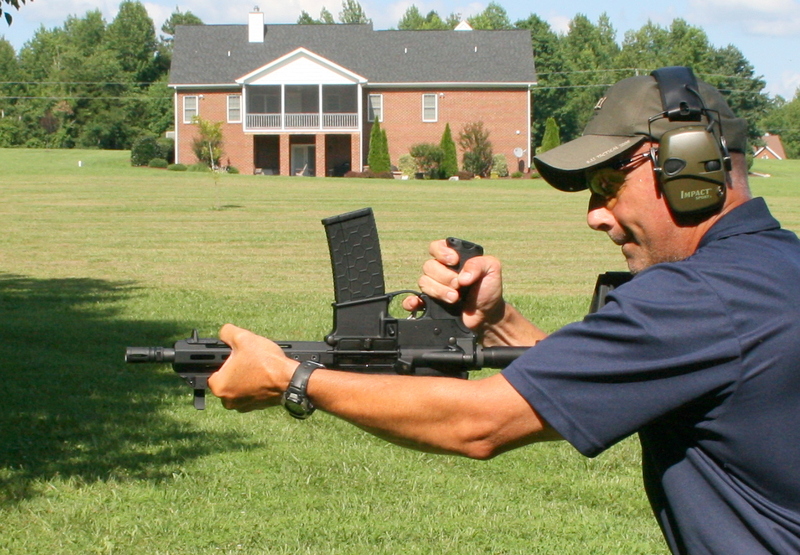 Legally, the brace can be shouldered and shot like any other carbine. Although the brace is nine inches short, I did not feel that I was crowding the gun. It is attached to the Tactical Buffer tube, which houses the Carbine H heavy Tungsten buffer body and spring. The heavier Tungsten buffer attenuates recoil, augments reliability, and prolongs parts life. The proprietary lower receiver is forged by SA and enjoys the same treatment and grade of aluminum as its upper receiver does with an “Accu-tite” device that snugs up the fit between lower and upper. Tension is adjustable, but the pistol grip has to be removed to gain access to the tension screw. This device increases accuracy potential. The BCM trigger guard is enlarged for winter gloves and the company’s nickel boron treated single-stage trigger exhibits zero take up and breaks crisply at six pounds. The trigger guard is hinged for increased access. Trice fires SAINT free hand without brace in shoulder from speed kneeling. This produced better downrange results than one-handed shooting with stabilizing brace attached to forearm. Loop sling would help here. The BCM Mod 3 pistol grip is securely checkered and stippled. Grip angle is perfect and the back strap is clean to permit the hand to slide up for a high grip. The grip has a vented trap door for accessory storage. 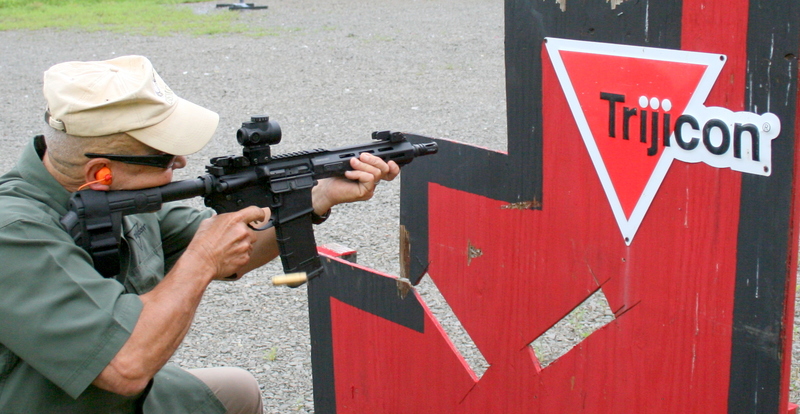 Controls, such as the safety/selector and magazine release, are typical AR and easy to access with the firing hand if you are right-hand dominant. If you need a sling, a Bravo Company Mfg QD swivel mounting point is built into the receiver end plate, and a QD M-LOK point can accommodate a front swivel. Its magazine well is standard GI and comes with an orange plug for storage. Internally, the bolt-carrier group consists of an MPT 9310 steel bolt and is treated with enhanced M16 Melonite. Weight clean is 5.5 pounds. Weight loaded with optics, BUIS, and 30 rounds of 125-grain ammunition is 7.1 pounds. Length is 27.75 inches. In its padded nylon carrying case, you will find one 30-round Magpul PMAG .300 BLK caliber-specific magazine, magazine well plug, cable lock, a Hex “T” wrench, and adjustable metering screws to adjust the gas block, plus manual and documentation. Trice fires SAINT inverted. Although it did not like some ammo, pistol did not choke. The SAINT will function with AR-15 magazines, but the PMAG primarily addresses reliability issues that occur with subsonic ammunition when using standard 5.56x45mm magazines. The PMAGs have more distance between the forward ribs of the magazine to accommodate the larger bullet. Initially, retired U.S. Air Marshal Ken Trice (STRAC Training Concepts) and I sighted in the SAINT at 50 yards with the Bravo Company Mfg sights. From a prone position, Ken was able to put two strings of three 125-grain Black Hills Ammunition (BHA) OTM rounds within the three-inch bull. I wanted to establish baseline accuracy with a mid-weight round. Muzzle report and ballistic crack were familiar and sounded much like the AK-47 round. Recoil is mild but a notch above our military round. According to people who measure such differences, the .300 BLK has three times the recoil of the M4 carbine. At close quarters, muzzle blast was less severe than 5.56x45mm. SAAMI pressure specifications for the .300 BLK are 55,000 psi and for the 5.56x45mm, 62,366 psi. USMC Colonel (Retired) Frank Martello, VP at Trijicon, spanks steel at 100 yards with highly accurate and rugged MRO red-dot sight. An aluminum housed reflex-style sealed sight intended for long-gun use, the Trijicon MRO offers a 2.0 MOA adjustable red or green dot on three different variations, with a large aperture for binocular sighting. The version used for this article rides on a Full Co-Witness mount. Fully protected sight adjusters move bullet strike ½ MOA per click at 100 yards. Suggested retail price is $639.00. BHA was very generous and provided us with enough ammunition to conduct the sight-in with both iron and optical sights. USMC Colonel (Ret.) Frank Martello, now Vice President at Trijicon, mounted the Trijicon MRO (Miniature Rifle Optic) red-dot sight and adjusted it until the dot hovered over the front sight post. BHA makes quality ordnance, but we had one pesky round that would feed but fail to detonate because of light primer hits. It required a cleaning rod to punch out of the chamber. In addition, one of the cases I picked up had a blown primer, which caused subsequent functioning problems. After approximately 70 rounds, the SAINT suddenly had no trigger and although cocked, could not be put on safe. Frank opened the pistol and we checked the trigger group. Everything was locked up, which ended the shooting day before it had really gotten started. Frank Martello of Trijicon checks SAINT group. Groups were fired with Lead Sled and Trijicon MRO. Black Hills Ammo was used to establish zero and accuracy baseline. 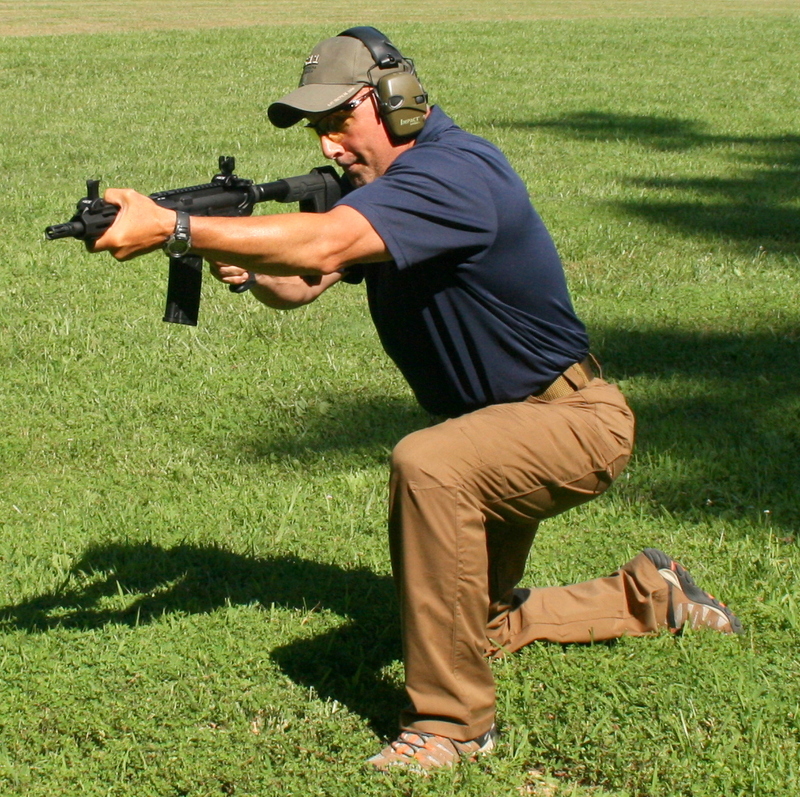 Gun Tech Doug Belcher of SSG Tactical in Fredericksburg, Virginia—a very sophisticated Class 3 establishment—is one of the best firearms trouble shooters on the East Coast. He knew right where to look as soon as I described the symptoms. What was left of the primer and anvil was barely visible to me, but it was enough to render the SAINT hors de combat. Black Hills Ammo is among the finest ever to complement a firearm, and I consider this an anomaly for the product. But BHA’s Carl Bullock wanted to examine the entire shipment and replace it with a different lot. Subsequently, the BHA lab tested the ammunition in question. Rounds were fired through a seven-inch SBR and a 16-inch SAAMI pressure test barrel without any blown or loose primers nor any evidence of gas leakage around the primers. Chamber pressures were well within SAAMI specifications. Interestingly, the returned ammunition exhibited a drop in chamber pressure from when it was manufactured, but resulted in a velocity increase of 13 feet-per-second. Carl advised that the ammunition should have performed as advertised and will fire the remaining rounds through some different platforms and advise if they discover anything. I was very impressed with Discreet Ballistics subsonic 190-grain solid “Target” load. It was the only subsonic round that cycled the SAINT’s action without adjusting the gas block. But once again, I had a failure of a round to completely chamber when I loaded five rounds of Discreet for chronographing. I slapped the bolt release and the bolt flew home. I mounted the piece and pressed the trigger. Nothing. No trigger. Nothing. I hit the forward assist. Repeat. Nothing. Again, the bolt was not fully in battery and I could not manually operate the bolt to clear the chamber or fully seat the round. The round was stuck. With great care because of the live round, I tried different kinetic solutions without success. Eventually, the judicious use of a screwdriver pried the bolt a millimeter or two back and freed up the round, which was not disfigured and had a clean primer. It fired with others when it was subsequently rechambered. I like to initially run semi-auto long guns with minimal lubrication to see how long they can function while dry, and the SAINT may have been thirsty. 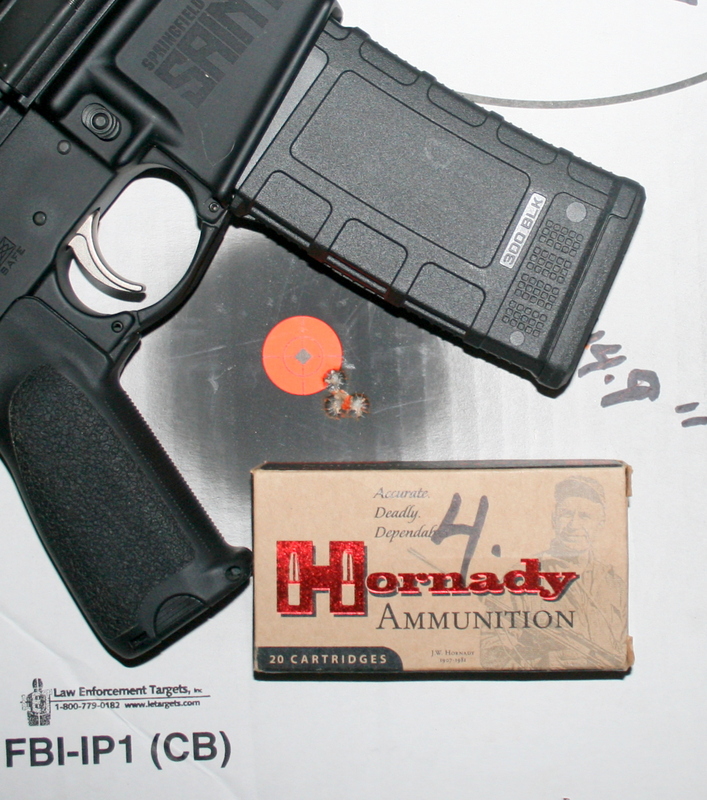 Hornady 135-grain FTX and SAINT produced one-hole group. With reciprocating parts made wet, the SAINT ran without further drama. Peppering steel targets with doubles, triples, and six-round hosings, the shouldered pistol was easy to keep on target out to 50 yards. 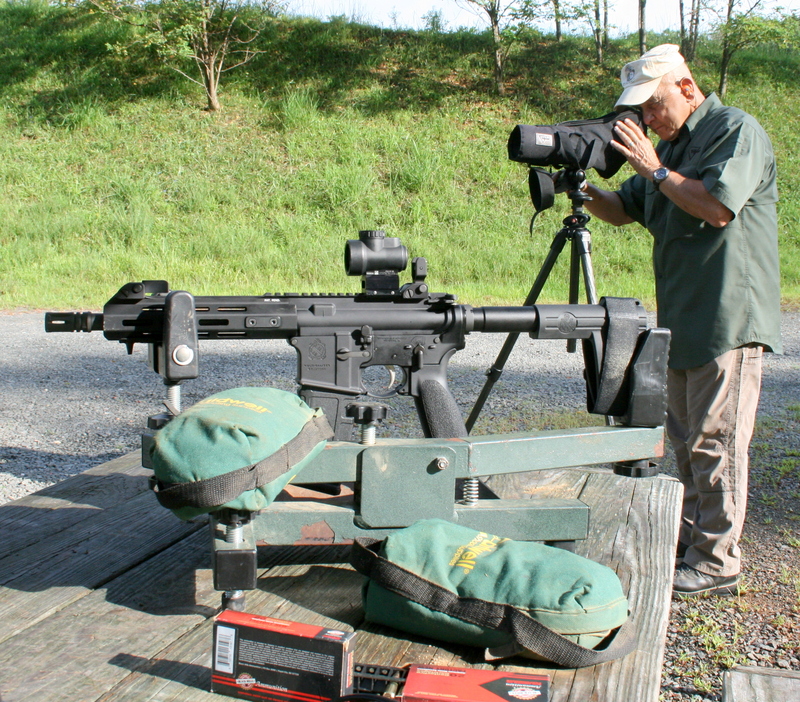 Pounding steel at longer ranges got monotonous with the Trijicon MRO steering the SAINT. It’s a little expensive to make it a frequent plinker, but it is certainly a serious firearm for vehicle or home defense. Potential overpenetration can be reduced with lighter frangible or pre-fragmented ammunition. Hornady 135-grain FTX produced impressive groups of 0.44 and 1.78 inches at 50 and 100 yards respectively. The .300 BLK SAINT is a slick, fast-handling, and lightweight weapon that could handle most urban tactical situations with a complete subsonic option. It may not like certain types of ammunition, but with sufficient lubrication generally runs fine. Accuracy is excellent. Recoil is mild and will appeal to all levels of shooters. While a bit more expensive to feed, it is plain fun to mow down eight-inch plates at 100 yards with little change to the sights. But like a handgun, the compact SAINT could accompany you concealed in a sports bag, while visiting many venues. With the proper ammunition, its overall size and weight make it a handy home or vehicle defense weapon, and you can do it quietly. Price point is excellent. Average five-round groups fired from a rifle rest at 50 yards. One load was fired again at 100 yards for comparison purposes. Average five-round velocities obtained from an M2 CED chronograph with screens 15 feet from the muzzle. Temperature 90 degrees.